The Dwarves of Redwall are builders. Their city stands on three great terraces carved from the side of a mountain, and the walls are grounded by massive octagonal cannon towers. As with any dwarven city, the overground structures, temples and railway stations are just the surface. Below the city mines and tunnels probe deep into the earth. 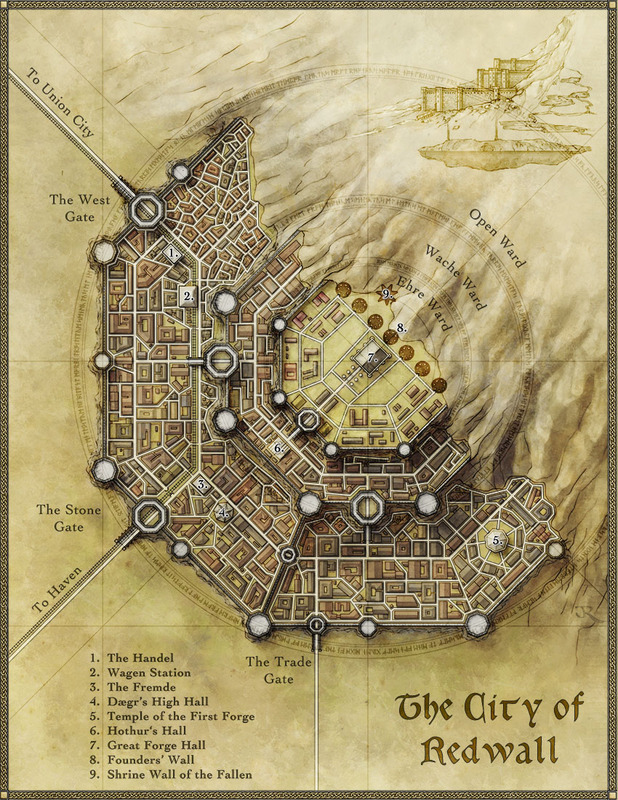 This city map was created for the world of Rhune: Dawn of Twilight, and maps the city that appears in both the world map, and the regional map of Vallinor. The challenge with this map was to give a sense of the order of the city, and use some decoration to hint at the dwarven flavour. I’m definitely looking forward to doing more work on the Rhune setting, and I believe that will include more cities.